Few people ponder the form of an object as mundane as a window. 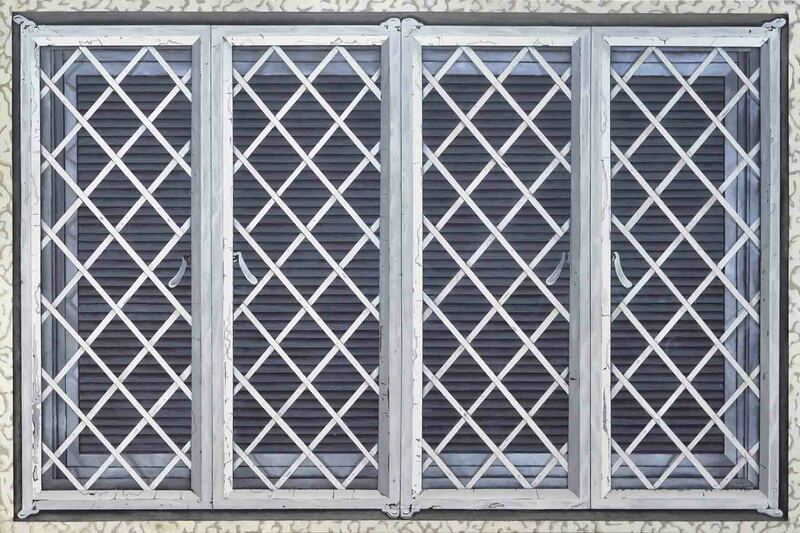 Outside the community of architects and perhaps interior designers, one would be hard-pressed to find a layperson with an opinion on the utilitarian beauty of a brise soleil or indulge at the sight of an elegant wrought-iron lattice. Fewer still would stop to wonder at dust-filled screens, of closed panes opaque with dirt, or a louver’s slats of glass that reveal glimpses of darkened interiors. In his paintings in Viewfinder, Pope Bacay reveals, not so much a fascination, but a seemingly underlying passion for the common window. 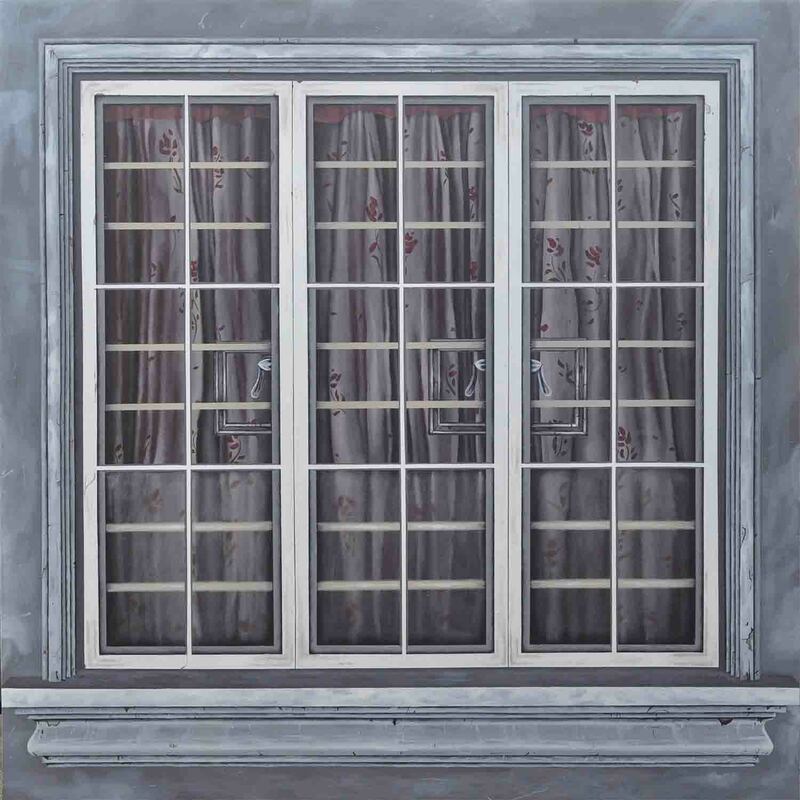 The artist’s recent work visually stems from his earlier paintings of houses and their various architectural features, both in its somber palette and realistic rendition. Yet here, Bacay sets his sights only on the regular grid of what is essentially a hole in the wall. 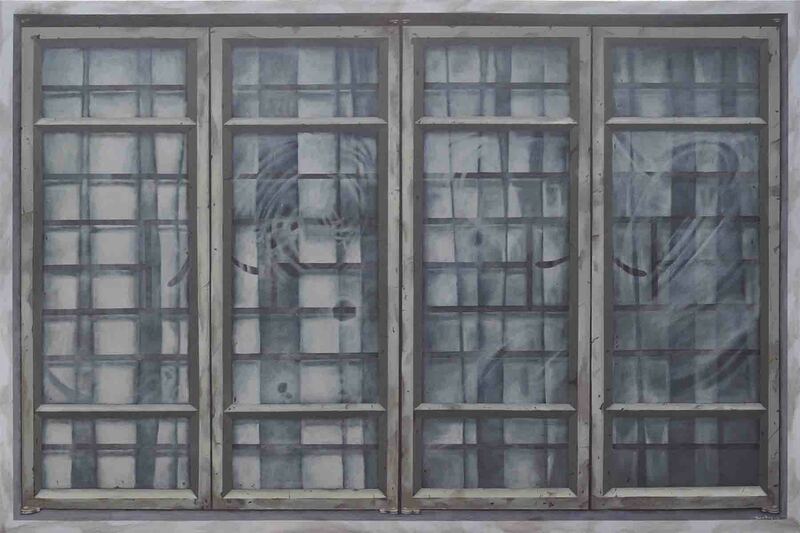 While artists of different media have also afforded a more than passing curiosity on the window, their interests have focused mainly on the view that lies beyond its rectangular structure. Indeed, windows have long been constitutive of acts of seeing and being seen. Its relation to the visual and the optic can be traced as far back as the 15th century, when the Italian architect, painter, sculptor, and mathematician Leon Battista Alberti described the act of painting as akin to peering through a window and rendering onto the surface the subject that lay beyond the frame. Even the earliest-known photograph, produced around 1826 by the inventor Joseph Nicéphore Niépce, had consisted of a window and a view. Searching for alternative ways to create images, Niépce had captured and affixed an image of his estate from his studio window in France. The window as device that frames the world has deeply-held roots in the history of art. 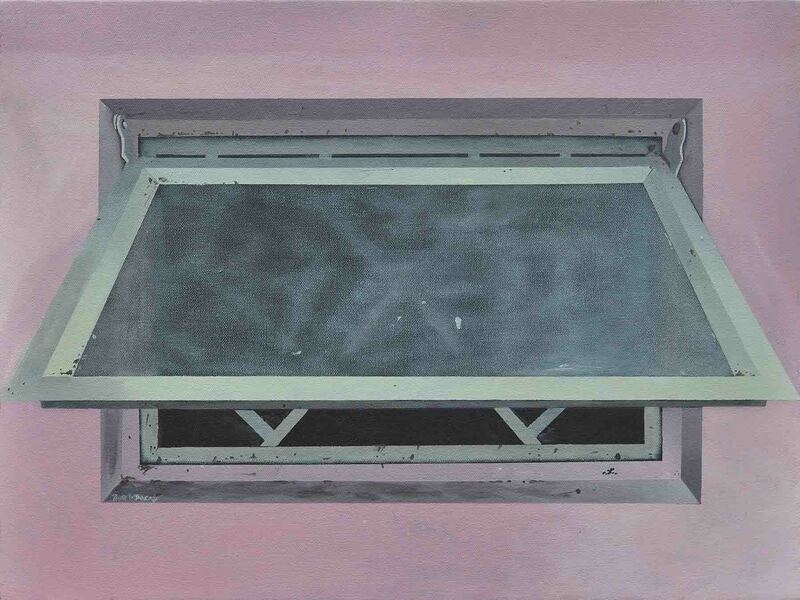 Other artists closer to our time have similarly taken up visual themes of windows and framing. Andrew Wyeth’s Wind from the Sea (1947) features a window that frames a wide expanse of sky and soil, as transparent curtains softly billow into the room. In this case, the main focal point is not the view, but rather, the wooden window frame and the movement of the delicately painted curtain. Fellow American artist Edward Hopper also utilized windows, but unlike Wyeth, they explicitly acted as viewfinder and framing devices. The painter situated his subjects within or beside windows, their structure serving to highlight the prominence of the painted figure. In Night Windows (1928), the viewer is located outside, voyeuristically looking into the lighted interior of a room several stories up. One readily recalls nights riding Manila’s elevated train system as it glides closely through the looming buildings of Avenida– here a family dines under the TV screen glare of a residential apartment, a hapless man sits on a sofa near the window on a hot summer night, students hunched up on their desks in a late afternoon class in the Universidad de Manila. It is in Hopper that windows as thresholds between the inner and outer spheres, between the private and public, become readily apparent. 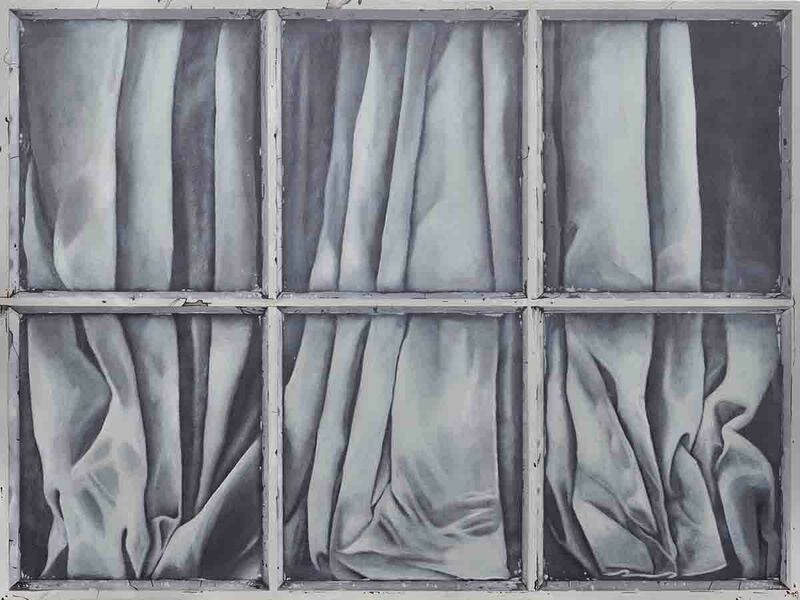 Similar with Wyeth, Bacay focuses on the physical aspect of the window at the expense of a view beyond. Most of his windows are closed tight and shuttered down, the interiors in shadows or covered by curtains from prying eyes. Opaque and unyielding, we are brought instead to a plaintive meditation of the frame. 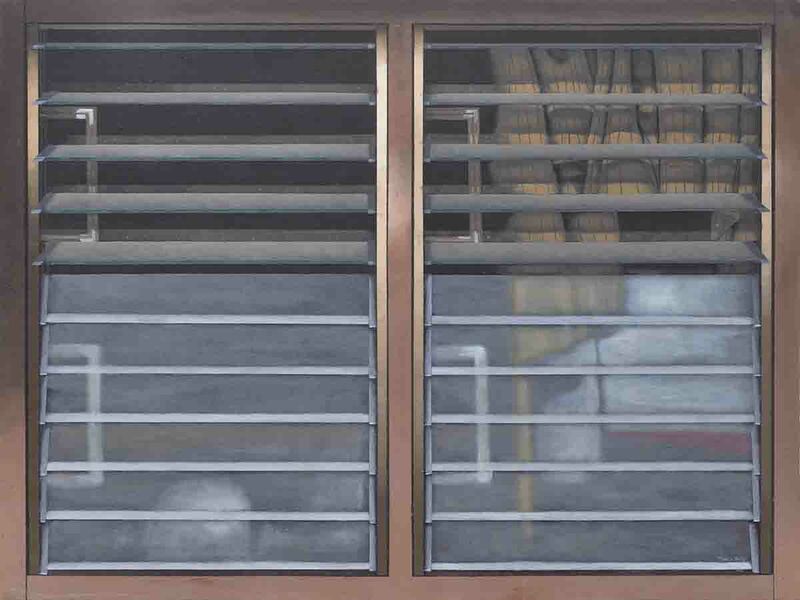 Ironically, it is also through this lack of a view that Bacay’s works find resonance with Hopper’s. But while Hopper allows the gaze to enter from the outside in, towards the subject/object of curiosity, Bacay stops our gaze short. The former is that of desire, the travelling gaze that sees but cannot covet. The distance that does not close in upon itself. The latter is that of a mystery, the enigma behind a screen that dares not reveal its depths, the private interior that cannot be pierced. It dares instead to imagine– potential scenarios, fictional intimacies, dark happenings– a mental act also arguably rooted in desire. Windows as sights, as objects of curiosity, as reimaginings. When the late Transport Minister Jose Dans Jr. decided to produce a picture book of the LRT 1, he included within its pages– amongst the numerous photographic images of the Metrorail cars, of Manila’s streets and veritable post-war buildings, and teeming crowd of commuters– three full-color photo spreads filled, quite simply, with windows. In one photo, a man emerges from under an awning window, spotting something from the distance. In another, a clothesline hangs from a red, wrought iron screen. Having been afforded an elevated view of the city, commuters peered through train car windows and found themselves eye-level with architectural features they could only once see from the street. They were seeing the windows for the very first time, as we are perhaps, seeing windows through Bacay’s eyes for the very first time. Painting after all is always a reimagining, an evocation to see fresh, with new eyes. In the Poetics of Space, French philosopher Gaston Bachelard described the philosophy of poetry as one that needs “total adherence to an isolated image; […] in the very ecstasy of the newness of the image”– a description that can be readily applied to painting too. And yet, newness is so often tied to invention, to strange sights, shiny oddities that resonate little in our lives. 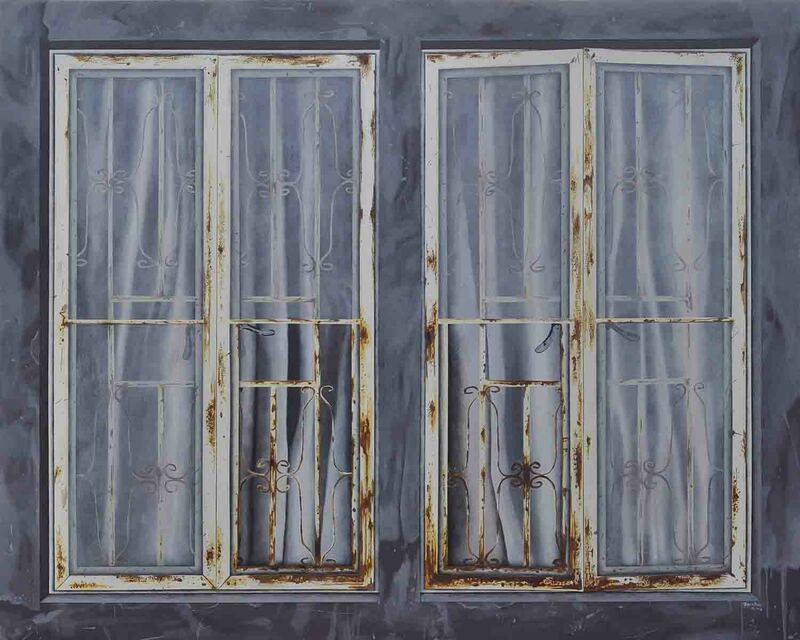 In contrast, these paintings– windows mostly of homes– provide comfort. Perhaps here lies the paradox, and possibly the allure, of Bacay’s works. By negating the surrounding environ, the windows appear dislocated, peculiar, and new, at the same time as they evoke stirrings of old sights, smells, and sound. Is it possible to feel nostalgia for an image we have now only seen? Once again we return to Bachelard, who had described the poet-artist as one who “does not confer the past of his image upon me, and yet his image immediately takes root in me”. A window that could have easily been the window of your grandmother’s house, as you jumped on the sofa when you were a child. That same window that you peered into while waiting for your parents’ return. Or the window from which you called out the name of a neighboring friend who was out on an afternoon walk. This idea of the reverberating image, the new sight that feels strangely familiar, one that has taken root as if we had hailed it from our own memories– this lies at the heart of Bachelard’s poetics, and it could very well be at the core of Bacay’s windows as well. Bachelard, Gaston. The Poetics of Space. Trans. by Maria Jolas, New York, Penguin Books, 1958.